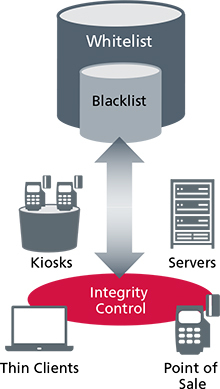 McAfee Integrity Control blocks unauthorized applications and change on fixed-function, point-of-service infrastructures, including ATMs, point-of-sale (POS) systems, and kiosks. Combining industry-leading whitelisting and change control technology, Integrity Control prevents out-of-policy changes while still allowing updates from authorized sources. It boosts control over change policies and effectively secures devices, using a centrally-managed and efficient solution. Comprehensive change policy enforcement — Get continuous change detection capabilities, while proactively preventing unauthorized, out-of-policy change attempts. Integrity Control links protection directly to policy and verifies changes against the source, time window, or approved change ticket. Changes outside of policy are blocked, greatly reducing change-related outages and compliance violations. Viable security for fixed-function devices — Integrity Control uniquely extends a layer of protection to devices with a fixed CPU or memory, including POS terminals, ATMs, and medical imaging systems that perform critical functions and often store sensitive data. A low-overhead footprint does not impact system performance, and it is equally effective in standalone mode, without network access. Centralized deployment and management — Get seamless integration with McAfee ePolicy Orchestrator (McAfee ePO) software to ease deployment, management, and reporting. The single McAfee ePO console lowers the cost of ownership by consolidating security and compliance management, eliminating the need to manage data in two separate systems. Streamlined remote deployment via the McAfee ePO platform easily manages and reports on large enterprise rollouts, all from a central location. An efficient, transparent solution — Integrity Control runs transparently on fixed-function systems, enables the entire point-of-service infrastructure to be monitored without impact, and can be set up quickly. This flexible, affordable, and secure solution dynamically manages whitelists and supports multiple configurations for different business needs and devices. McAfee® Integrity Control software combines industry-leading whitelisting and change control technology to ensure that only trusted applications run on fixedfunction devices, such as point-of-service (POS) systems, automated teller machines (ATMs), and kiosks. McAfee Integrity Control software provides customers with continuous change-detection capabilities while also offering the capability to proactively prevent unauthorized change attempts. McAfee Integrity Control software uses a trusted source model, so that even when systems are locked down, software updates from authorized sources are still allowed. Track changes to critical files and directories continuously across fixed-function systems. Eliminate the manual effort of maintaining databases, rules, and updates on fixed-function systems. Ensure changes are made according to authorized policy and process. No additional operational overhead on fixed-function devices. Ensure that only approved software runs on the point-of-service infrastructure, without imposing additional operational overhead. McAfee Integrity Control easily blocks unauthorized, vulnerable, or malicious applications that can compromise the security of critical systems. Verify changes against the source, time window, or approved change ticket. Changes attempted outside of policy are blocked, and the attempt is logged and sent as an alert to administrators, reducing outages and compliance violations. Check files and directories for changes to content, permissions, or both. Integrity Control provides continuous file integrity monitoring, essential for testing and verifying the security of an environment and meeting critical compliance requirements, including PCI DSS. It delivers comprehensive information about every change, including the user and the program used to make the change. Extend a layer of protection to devices with a fixed CPU or memory, including POS terminals, ATMs, and medical imaging systems, with a solution that does not impact system performance. Count on continuous information about change events across the point-of-service infrastructure to comply with PCI DSS requirements. Integrity Control details which server or servers originated the change, when it was made, which user made the change, how the change was made, what content inside the file changed, and whether the change was approved. Eliminate the need for IT administrators to manually maintain lists of approved applications. Instead, IT departments can adopt a flexible approach, relying on a repository of trusted applications that run on endpoints. This prevents execution of all unauthorized software scripts and dynamic link libraries (DLLs), and further defends against memory exploits. Get seamless integration with McAfee ePolicy Orchestrator (McAfee ePO) software to ease deployment, management, and reporting. The single McAfee ePO console consolidates security and compliance management, lowering TCO. McAfee Integrity Control software enables the IT organization to ensure that only approved software runs on the point-of-service infrastructure without imposing additional operational overhead. McAfee Integrity Control software easily blocks unauthorized, vulnerable, or malicious applications that can compromise the integrity of critical systems. The solution’s dynamic whitelisting trust model keeps systems tightly secured yet allows for authorized updates or changes to be made from administrator-defined trusted sources. This eliminates the manual and costly support associated with other whitelisting technologies, as no databases, rules, or updates are needed. The McAfee Integrity Control software also leverages change-control technology that can block unwanted, out-of-policy changes before they occur. This level of protection is linked directly to policy, and changes can be verified against the change source, time window, or approved change ticket. Changes that are attempted outside of policy on enabled systems are blocked, and the change attempt is logged and sent as an alert to administrators. This greatly reduces change-related outages and compliance violations. McAfee Global Threat Intelligence (McAfee GTI) is an exclusive McAfee technology that tracks the reputation of files, messages, and senders in real time using millions of sensors worldwide. This feature uses cloud-based knowledge to determine the reputation of all files in your computing environment, classifying them as good, bad, and unknown. With McAfee GTI integration, you’ll know with certainty when any malware has been inadvertently whitelisted. The GTI reputation is accessible in Internet connected as well as isolated McAfee ePolicy Orchestrator® (McAfee ePO™) software environments. Through file integrity monitoring (FIM), McAfee Integrity Control software monitors files and directories for changes to content, permissions, or both. McAfee Integrity Control software provides continuous FIM, which is essential for testing and verifying the security of an environment or meeting critical compliance requirements such as those outlined in the Payment Card Industry Data Security Standard (PCI DSS). McAfee Integrity Control software provides comprehensive information about every change, including the user and program used to make the change. McAfee Integrity Control extends a layer of protection to fixedfunction devices such as kiosks, POS terminals, and legacy platforms to reduce customer risk exponentially. Seamless integration with McAfee ePO software eases McAfee Integrity Control agent deployment, management, and reporting. The single McAfee ePO console lowers the cost of ownership by consolidating fixed-function device security and compliance management. This saves IT organizations hardware, training, and operational costs, and provides unified control over the policies and protections on each enabled ATM, kiosk, or POS system. Integration with the McAfee ePO platform eliminates the need to manage data in two separate systems. Increased control over fixed-function systems—In regulated industries such as retail, financial services, and healthcare, devices such as POS terminals, ATMs, and medical imaging systems perform critical functions and often store sensitive data. 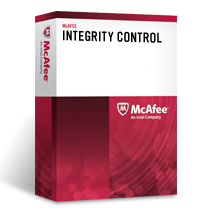 McAfee Integrity Control software is ideal for extending a layer of protection to systems that perform a fixed-function in terms of CPU or memory resources. The solution offers a low-overhead footprint that does not impact system performance and requires very low initial and ongoing operational overhead. It is equally effective in standalone mode without network access. Meeting and sustaining PCI DSS compliance—Many point-of-service systems such as ATMs, POS terminals, and kiosks are in scope for meeting PCI DSS compliance. 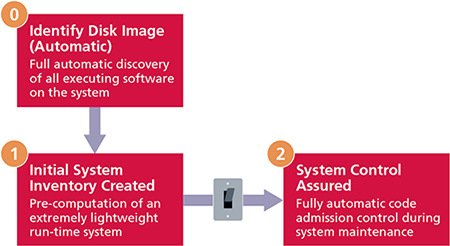 McAfee Integrity Control software provides continuous information about change events across the point-of-service infrastructure, which includes where the change was made (which server/servers), when it was made (time), which user made the change, how the change was made, what (content inside the file) changed, and whether the change was approved. This deep level of visibility into the point-of-service environment is delivered through the McAfee ePO platform and enables IT organizations to continuously verify the security of POS systems while validating PCI DSS compliance to auditors. Improve service availability—Downtime on fixed-function devices is often caused by unauthorized or untested change, and most of the time taken to restore availability to these devices is spent discovering what changed. This is due to a gap between actual change activity and the documented change process. This change control gap results in manual activity by IT departments to control and minimize the high costs of change and change-related outages. McAfee Integrity Control software enables IT organizations to achieve higher service availability for fixed-function devices by bridging this change control gap. McAfee Integrity Control software tracks changes continuously through the McAfee ePO platform and allows for the selective enforcement of change policies to prevent unknown changes from occurring before they cause a problem. McAfee Integrity Control software helps customers reduce the number of unavailability incidents (as measured by mean time between failures), as well as recovery time per incident (as measured by mean time to repair). Download the McAfee Integrity Control Datasheet (PDF). For more than 1,000 nodes, please use our Quote Request Form!